We’re excited to announce that our new and refreshed website is up and running! What was wrong with the previous one, you might ask? Nothing really regarding the performance, but it stopped serving our true identity once we started to outgrow ourselves and became something more than just a hackathon organiser. WHAT DOES IT MEAN? It means we are getting bigger, bolder and feistier with every year, and this should be reflected as clearly as possible on our website - as this is the mirror to the world of who we are. Today as an organisation we claim to empower young startups through our life changing hackathon experiences, and enable visionary entrepreneurs to continue their path through post-hackathon support offerings. We have passed the point of organising hackathons and offering on-spot mentorships for just 48 hours, and entered into a whole new era. Keeping the hackathons in the heart of the business, we’ve expanded our mindset and moved towards the point where we introduce profitable venture entrepreneurs into the mix, train successful mentors and contribute to the startup community, and inspire the ones who want to come out of their comfort zones by showing them real life examples. New website, does not only tell the story, but also shows the new approach via conclusive and interactive features. When the old website functioned like a blogging site where we announced upcoming events and published event related blog posts, our new website is built to reflect back our key-attitudes as well as organisational culture. We are more visible and clear than ever in regards of showing our credibility, supporting our existing and potential participants, and cooperating possibilities with partners and investors. The updated website provides improved functionality and a better user experience, supported by a more dynamic layout along with enriched content. The technical architecture has been improved to integrate it with our existing databases and enabling the possibility to add new features more easily in the future. Just like the old one, the new website was also built by Voog - Estonian based global CMS platform for building and managing exceptional websites and online stores. As a strong supporter of successful venture entrepreneurs, we are more than happy to work with ambitious founders and visionary products. While browsing around in our website, you might realise few new attributes and contents that are designed to bring up the engagement and enjoyment levels. A glimpse of our fast growing globalisation stating the countries we have been so far. Types of Hackathons (Garage48 Hackathon & Makeathon, Idea Garage, Student Startup Camp and Base Camp) with details both on our existing and potential partners who want to host or partially fund an event. Success stories risen from our hackathons and marching toward becoming multi-million dollar companies. More educational content addressing mainly to our participants and explaining what is a hackathon, why we need them, and how does the whole format works. User friendly and engaging features to simplify the interaction level with our audience. Now anyone can start planning how to host a hackathon, submit success stories or subscribe to our newsletter via one click solutions. Team page reflecting the organisational culture, introducing the team members and founders, emphasising the team values and potential career opportunities. Upgraded blog page offering hashtag based articles to catch up with startup life, success stories, annual recaps, entrepreneurial hints & tips, as well as dedicated Garage48 events. Let’s dig this feature a bit more! As regular Garage48 followers might know, we assign a special hashtag for all our events - G48empowher (Empowering Women Hackathon), #G48AH (Arts & Hardware Hackathon), #SSC (Student Startup Camp) to name a few. Beside the common buzz we aim to create during the events, we also do it to link our event pages to corresponding blog posts. This was something we were doing before as well, but we took this feature and upgraded it with multiple hashtags to link more content for our readers. 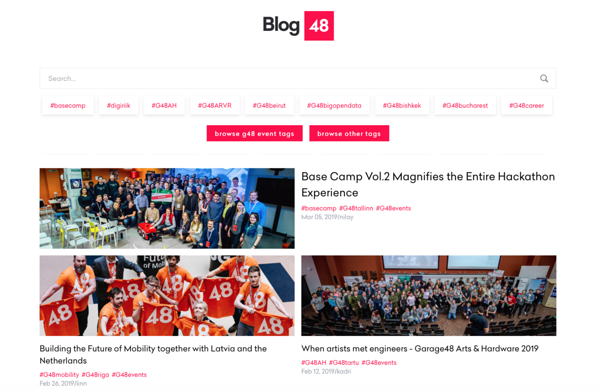 In other words, once a user clicks on a blog page assigned to a specific hashtag, let’s say #G48AH and #G48Tartu, he/she will be able to see all the contents about Arts & Hardware Hackathons and Tartu Hackathons organised by Garage48. Moreover, we have categorised all our blog posts based on the topic - startup life, success stories, hints&tips, our recap stories, career topics and etc. In a nutshell, we turned our blog page from an event-based content platform to a more lifestyle-based news platform, where everyone finds something for themselves nicely and easily. Special thanks to all the supporters and contributors who helped to launch our new web: designers, developers, colleagues, mentors, founders and friends… Thank You! We encourage everyone to visit and explore the site and to discover the full spectrum of Garage48! Let the new website be our pathway to the next, amazing world-changing adventures!